Someone just asked me “So, what is Project Based Learning?” and after making a couple of attempts to come up with a simple definition, I realized that it’s not an easy question to answer. This is a complex concept and my understanding of it has evolved over time. I’m sure different people will explain it in different ways, and I hope that people will feel free to add to (or argue with) my definition. First of all, it’s important to understand how PBL is different from the kinds of projects many of us were given as kids, such as “make a diorama of your favourite scene in the book” or “make a timeline showing the most important events of the WW II.” These projects were tacked on at the end of a unit, after most of the learning was done. In PBL, the project is the unit and students learn as they try to solve challenging problems that don’t have a single “right” answer. Students are given open-ended questions to answer, such as: What alternative energy sources can our school use? How are the wetlands important to the environment? Are we in the midst of a recession or a depression? Students come up with the questions that drive their thinking and they make choices as to how they will present their learning. PBL develops several skills at once. Students learn to do research, use technology, work collaboratively, and use critical thinking skills. Many projects are cross-curricular in nature, meaning teachers may decide to team up with each other across subject areas. For instance, as students produce a documentary in their history class, the Language Arts teacher may be involved in helping them write up their script, while the Math teacher may help them with statistics and graphing. Choice is extremely important to a successful project. It may be tempting to dream up a fascinating assignment with a cool final presentation format and offer it to our students, but when teachers do this, they often find that their students don’t buy into it. 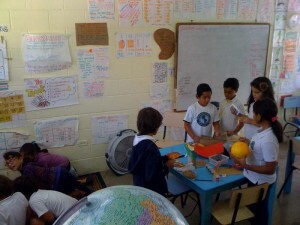 Brainstorming ideas, designing the project, and coming up with the final product is what makes PBL so motivating to kids. (On a side note, see Fall Down 7 Times, Get Up 8 by Debbie Silver for more on motivation). Of course, there’s a few challenges involved when it comes to Project-Based Learning, but when mastered, it’s an incredibly effective teaching technique. This is definitely not about making the students do a fun little hands-on activity at the end of a unit! PBL is all about structuring an environment where students develop and practice skills in real-world situations. It’s a scaffolded process of inquiry around complex and authentic questions, that yields high-quality, student-developed products. It is a challenging road ahead but worthwhile and, I believe, necessary! !